Now that the TLC reference is out of the way in the title, let’s get to the good stuff. And no, I don’t mean the drugs that waterfalls were a metaphor for in the song. In all seriousness, there’s something about the sight, sound, and energy of cascading water that is mesmerizing, invigorating, and relaxing all at once. 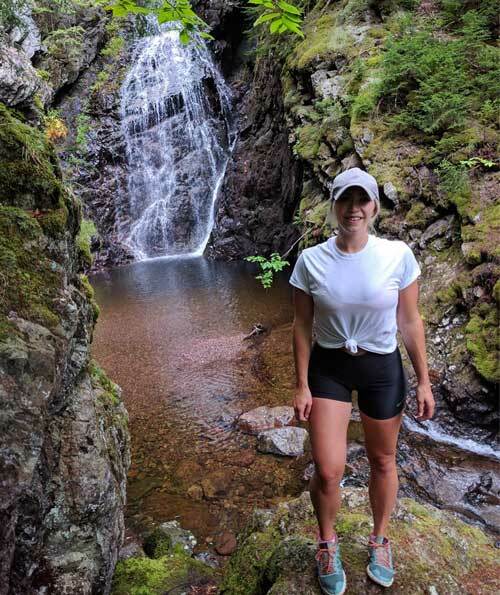 My favourite adventures typically involve seeking out a point of interest, and bodies of water—and waterfalls in particular—are just so rewarding. 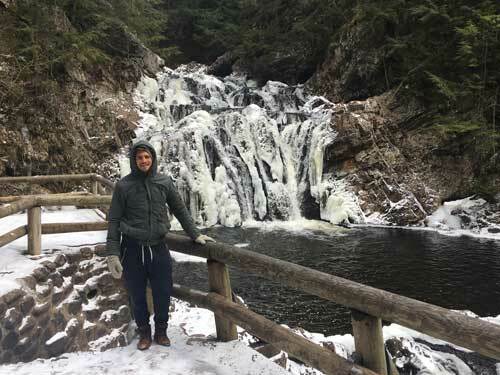 Brett and I have made it our mission over the last few years to discover as many waterfalls in Nova Scotia as we can (although we’re nowhere near this blog which features an impressively thorough and helpful repertoire of just about every waterfall in Nova Scotia). 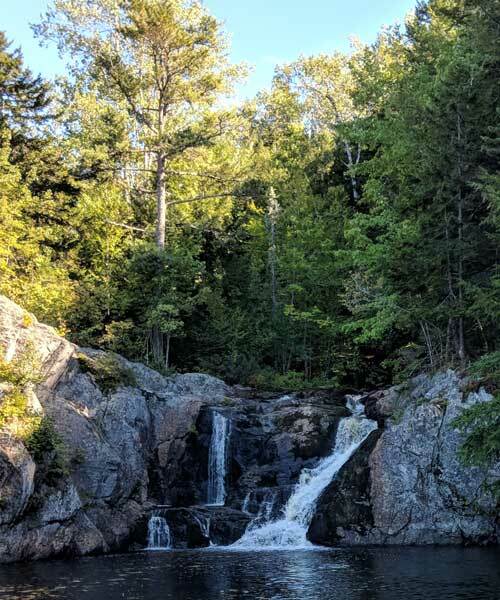 The result: I’ve rounded up some of our favourites in this post, featuring waterfalls from all across mainland Nova Scotia. For waterfalls in Cape Breton, you can refer to a separate post (there are so many good ones it deserved its own!). 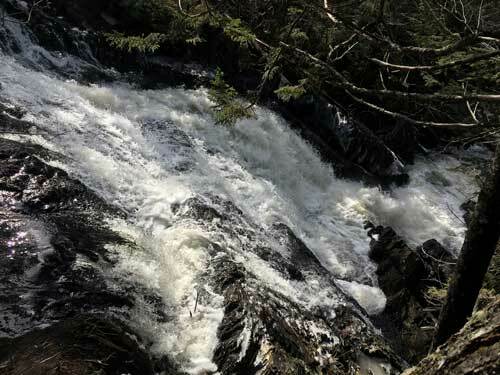 Most of these waterfalls are at least an hour from Halifax, but are well worth a day trip or adding it to your itinerary on a weekend getaway. 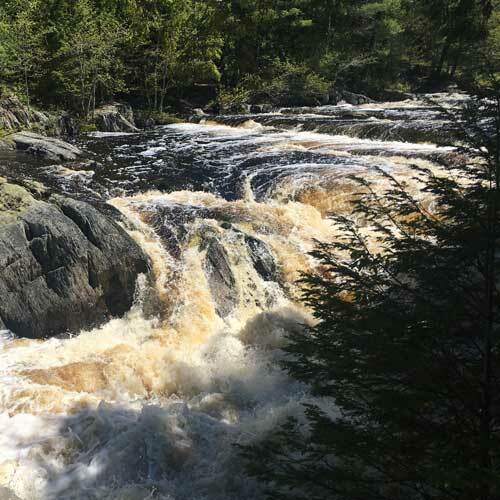 Read on to discover 10 waterfalls of all shapes, sizes, and distances on mainland Nova Scotia. This impressive, 50 foot high waterfall is situated right on the coast. There is no trail or hike required to get to the falls; just park and walk toward the falls! Be sure to check the tide times when you plan to visit. If you’d like to go up close to the falls, go at low tide—otherwise the base of the falls will be filled in with water. This is one of my favourite waterfalls in Nova Scotia, and in my opinion, one of the most beautiful. It’s a two tier fall—the upper fall is a true drop of 30 feet, which pools, and then turns into a wide cascade at the bottom. The fall is only a few dozen meters down the hill from where you park, so not much of a hike involved. Warning: the dirt road you must go down to get to this waterfall is in very rough shape with many large potholes (as of November 2018). Not all vehicles would fare well, so drive with caution, or consider parking at the end of the dirt road and walking up if you have some extra time/energy to spare. This is a large, powerful waterfall that is best viewed from the top. There are some ropes to get down to the base, but it is incredibly steep and slippery, so I wouldn’t risk it. Not much of a hike involved here—there is a small unofficial trail which is a few dozen metres and leads you to the top of the falls. Warning: the dirt road you need to take to the parking area isn’t in great condition; be careful of potholes and large rocks. You can see the falls from up above, and then circle around on the other side to see it from the base from across the pond. The trail to get to the falls is a few kilometers total (3-4km), is relatively flat, and is well defined. This is a nice easy hike. 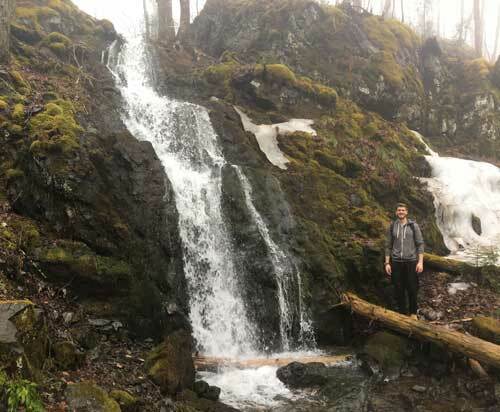 This waterfall features a cascade of about 50 feet located in Blomidon Provincial Park. Like many falls, the flow largely depends on the time of the year and how high the water is—i.e. it might not be as impressive in August as it is in April. This isn’t as intuitive to get to; when you park in the main lot, go up the street to the left (not toward the beach where the other trails are). 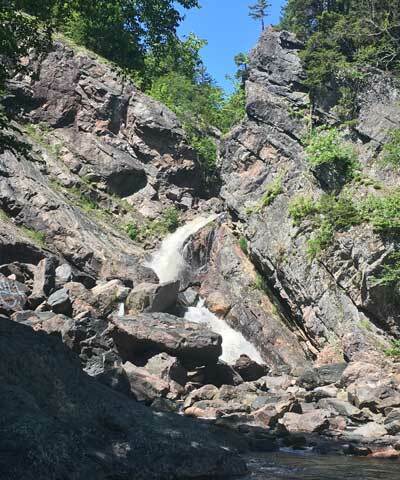 Your total hiking time/distance can depend on if you just want to see this waterfall, or if you’d like to combine it with a larger hike in the park (there are many other beautiful trails here!). 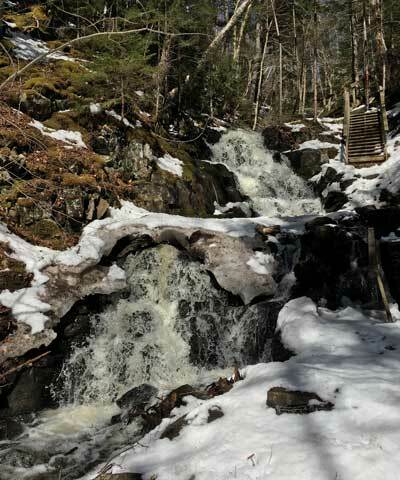 The Borden Brook Trail is 3.5km and climbs to a height of 185 m, crosses Borden Brook, and then is just a short walk to a waterfall. This is my favourite waterfall in Nova Scotia. It’s a three tier fall. The upper fall is a 20-30 foot drop which pools at the bottom (we’ve skinny dipped here before!). From there, the flows and pools again. The walls of rock carved out by water and into pools is so stunning—this place has a magical energy about it. The hike in from the road is short and easy (follows a cart path) about 10-15 mins. The challenge here is if you want to get up to the upper part of the fall, which requires climbing and scaling a steep hill. Know your limits and proceed with caution if you decide to climb up/down. This is not an official trail—you literally pull off the side of the highway at the coordinates, look for the path, and follow the river upstream. 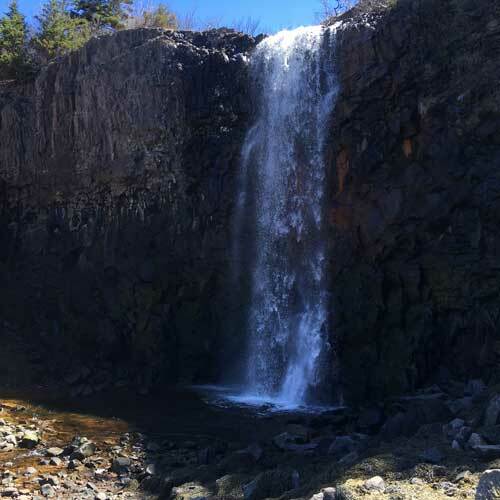 This waterfall plunges through a steep-walled gorge, featuring some of the oldest rocks in Nova Scotia. The hike to the falls is about 2km. The trail has some infrastructure, including a steep staircase to the base of the falls. Be prepared for a haul on the way back up! This is a powerful waterfall along the Mersey River. It’s easily accessible and a few dozen meters away from the parking lot, but if you’d like to extend your hike, there are 2km of trails on either side of the river. You can cross the other side via a lovely bridge. This small but lovely waterfall is most impressive in the spring or when the water is high (i.e. if you go in a dry spell during late August, there may not be much to see). The trail has so much else to offer that even if the water is low, it’s still well worth a visit. The trail is about 6km and starts with a climb up Rogart Mountain, including a stunning look off, and then descends into the woods following the brook until you reach the waterfall. This is another petite and pretty waterfall to visit during all seasons. Victoria Park is a popular park and for good reason—it has a lot to offer visitors! It is a lovely balance of infrastructure and nature—the infrastructure offering a nice, leasurely walk among the trees and flowing river. Highlights in addition to the waterfalls include Jacob’s Ladder and an old wishing well. Let me know in the comments as you explore these waterfalls for yourself! 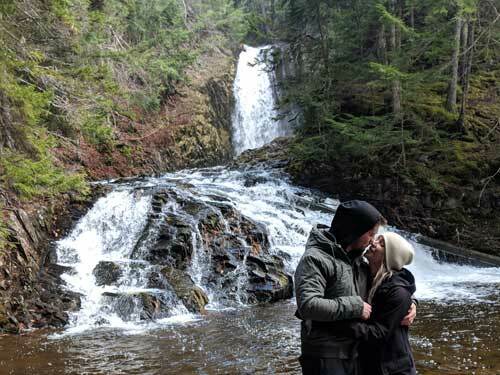 Which are your favourite waterfalls on the Nova Scotia mainland?